Berkeley, California: an epicenter of dynamic, multicultural cuisine that marries fine dining and cheap eats. It is a unique space where you can curb your appetite with an abundance of dumplings for less than a $5 bill or shell out $150 per person to partake in a multi-course, culinary experience curated by a literary genius. Whether an upscale eatery or a budget friendly hole in the wall, all local restaurants face the high rates of business turnover inherent to the Bay Area. Berkeley, like many other urban environments, is characterized by skyrocketing rent, intense competition and an oversaturated market of restaurants — all factors that contribute to the difficulty for local restaurants to keep their doors open. Take Elmwood — a quaint neighborhood within Berkeley that is composed of a small handful of restaurants, boutiques, and cafés. However, next to many of these unique storefronts exists a number of not-so-unique vacated units where businesses once stood. These locations have been boarded up and stripped of any recognizable feature, only adorned with glaring “For Lease” signage. Such is the fate of 2942 College Ave., previously C & C Cleaners; 2956 College Ave., previously Lululemon Athletica; and 2961 College Ave., previously Jeremy’s Department Store. Despite the revolving door of businesses currently facing Elmwood, a newly opened restaurant is taking this occurrence in stride, using it as an opportunity to solidify its niche market and strengthen its role in the community. In the Wood — a gastropub located at 2930 College Ave — opened its doors Feb. 19. The space was formerly occupied by Italian restaurant Cugini Manzone and, prior to that, another Italian restaurant, Filippo’s, which has since moved further down College Ave.
Berkeley native Ben Maniatis, the general manager of In the Wood, believes that the key to a successful business is considering the context of the neighborhood prior to opening doors in that area. 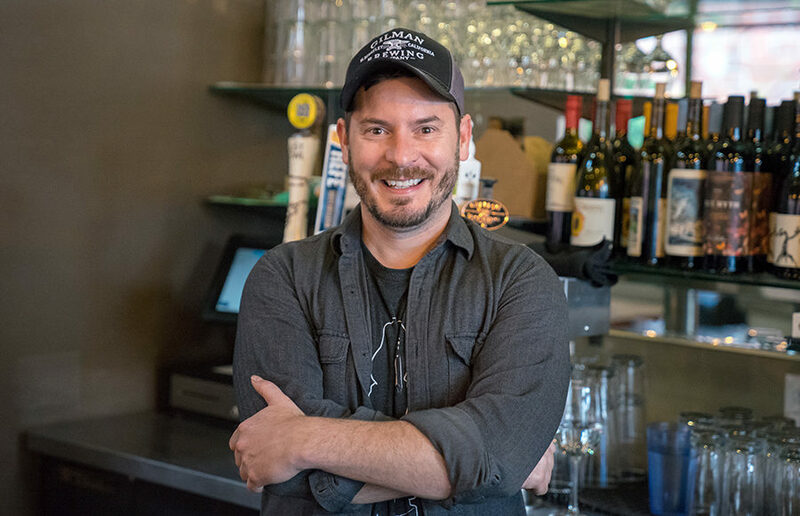 When establishing In the Wood, Maniatis — who has a long-term background in the restaurant industry — saw a deficit in Elmwood’s collection of shops and restaurants: a local hangout. “How come we have to go a mile down the street to go find little Rockridge?” Maniatis posited. “Why doesn’t Elmwood have its own hangout or local spot?” He went on to note the overabundance of Italian restaurants in the area. “What this neighborhood needed, I felt like, was a nice, warm gathering spot where people could watch Warriors games, Cal games, and just eat good food, drink good beer and wine. Simple: Less is more,” Maniatis said. Maniatis believes that by opening In the Wood, there will be a boost in foot traffic throughout the entire neighborhood, thus benefiting all Elmwood businesses. That said, Maniatis acknowledges the difficulty some face in keeping their businesses afloat. Maniatis cited high rent as one of the factors that contributes to the revolving door of businesses. “When I came and saw this spot in September, I got kind of worried there might be a turnover. What’s crazy is, even that coffee shop across the street, in one day you blink, and you’ve got now a salad place opening up,” Maniatis said. Maniatis is referring to Organic Greens, a gourmet salad and panini restaurant which is set to open soon at 2925 College Ave. The space was formerly occupied by The Beanery, a coffee and tea shop. He also argues that being a personable and hospitable host is key to a successful restaurant: “Talk to everybody, touch all your tables, and be sincere about it,” he said. “It’s (about the) sincerity of a welcoming environment. (Avoid putting) off an air of you’re too cool for school. I’ve lived and worked in New York and LA; I know that vibe and it doesn’t fly,” he continued. Long-term success is not an absolute impossibility, as evident by Elmwood Cafe, which opened its doors in 1921 as the Elwood Soda Fountain. Only time will tell how In the Wood fares against the Berkeley revolving door. Contact Sophie Haas at [email protected] and follow her on Twitter at @SophieHaasDC.